In many ways, the iPad is the perfect movie-watching companion when you’re taking in a flick at home. What could be better than a compact device that, with a few taps, can summon up a wealth of information about the movie you’re enjoying? If you’re a fan of older movies in particular, an app that gathers together all the available trivia, cast info, and other material about your favorite movies would seem to be a must-have download for your iPad. 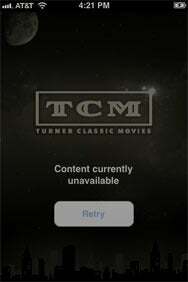 Unfortunately, TCM for iPad from TBS isn’t that app—not by a longshot. The official app for the Turner Classic Movie channel cobbles together information that’s freely available elsewhere, but asks you to pay to access it here. Worse, the app is buggy and behaves inconsistently from one session to the next, coming off like a movie that was hastily rushed into theaters with the hope that nobody would notice its glaring flaws. The centerpiece of TCM is a schedule of movies being shown on the cable channel. Here, the app enjoys one advantage over the likes of TV Forecast HD, Xfinity TV, or any one of the many other paid and free apps that provide TV listings: TCM’s schedule covers the next three months of programming. The schedule appears in an easy-to-scan grid with intuitive scrolling and tapping controls to move down the list of programming or jump ahead to a future day. Sadly, TCM squanders its schedule advantage by failing to include a reminders feature. If you happen to notice On the Waterfront is airing a month from now, you had best have a really good memory for these sorts of things—TCM for iPad doesn’t provide any way of scheduling a reminder for closer to the air date. The app also lacks a search feature to look up whether specific movies are airing any time soon, which seems like a grievous oversight. Tapping on a movie in TCM’s schedule brings up an overview page, listing the cast, director, and additional release information about movies. A sidebar lets you pull up biographies of the main cast and director, while other tabs provide links to the full credits, synopsis, quotes, trivia, trailer, and other details about the movie. The information in these sidebars can get pretty repetitive and seems oddly spartan. Casablanca, for example, may be the most quotable movie ever released—TCM’s app includes five snippets of dialogue, none of which include such immortal lines as “Of all the gin joints in all the towns…” or “Round up the usual suspects” or even “Here’s looking at you, kid.” More to the point, there’s nothing here that can’t be found in greater abundance in the better organized, very free IMDb Movies & TV app. TCM’s iPad app tries to distinguish itself in other ways with movie clips, photos, and links to the cable channel’s MovieMorlocks.com blog. The clips and photos are tied into shows that recently aired on TCM, so you have little control over that content. The blog loads sporadically in the app; you’re better off accessing it—for free—through the mobile Safari browser. ...unless the app fails to load any content at all. Sporadic loading is problem throughout the app. On more than one occasion in my testing, I’d fire up TCM only to be met with a “Content currently unavailable” message. Other times, a loading message will pop up on a page you’re trying to access and stay there for what seems like perpetuity. When content does load, it renders inconsistently. Sometimes when I tap on a movie to get more information, the ever-present Turner Classic Movies header will collapse into the Done button, rendering that button unusable. Flipping my iPad into a different orientation fixes the rendering issue, as does tapping the offending header which usually snaps things back into place. Still, it’s an unbelievably sloppy implementation. I tried uninstalling the app, restarting my iPad, and reinstalling TCM for iPad to see if that helped matters. To be fair, the app behaved a little more consistently after I went through all those steps, though crashes and inconsistent loading remained a problem. There’s also an iPhone/iPod touch version of the app, called simply TCM. It offers the same content as the iPad version, but rejiggered to fit on the iPhone’s smaller screen. On the plus side, the iPhone app avoids some of the more amateurish rendering issues seen in its iPad counterpart. But the experience is still marred by the same loading issues and the appearance of the “Content currently unavailable” message. When you ask people to pay for the kind of information they can get for free elsewhere, you need to either package that information in a convenient way or add a little something extra to the mix. In both its iPhone and iPad forms, TCM fails to do either. Movie fans should avoid the app the way they steer clear of a cinematic stinker.